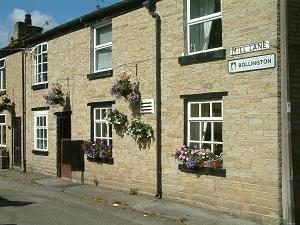 Right on the boundary of Bollington with Rainow, Mill Lane is one of the oldest roads in the district. It begins at the east end of Ingersley Road, on the corner of the Poacher’s Inn, and winds its way past an old farm, Hillside Farm, a field and then a few modern bungalows. The road then becomes a track suitable only for horses and pedestrians (can be muddy) and comes out on Ingersley Vale. Approach off Ingersley Road, Ingersley Vale (pedestrians and horses only). Leads to footpath access to Lowther Street. Nearest pubs – Poacher’s Inn on the road, Crown Inn. 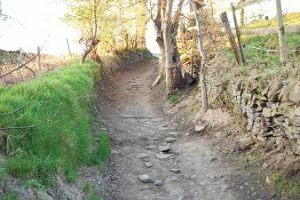 It is believed that Mill Lane was part of a Roman (or earlier) pack horse route leading from the Cheshire salt fields into the Peak District. 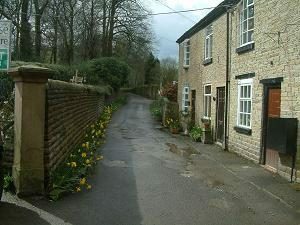 The drive entrance to Ingersley Hall (now known as Savio House) is off Mill Lane (off the left of this picture), right beside the Poacher’s Inn. The mill referred to is probably the original 15thC corn mill that is believed to have stood on the riverside where the green painted workshop is today. There is a weir and wheel pit in the river behind this shed. The wilder end of Mill Lane is no more than a bridleway. It can be wet in places down here.